Happy 1st day of June! I'm so excited for summer and all it brings. I love warm weather and long days. I'm joining in today for another round of Currently hosted by the lovely Jenna and Anne. Planning - for the arrival of family!!!!!!!!!!!!!!!!! Yes, I did just put that many exclamation points for all you grammar people. You're welcome. My sister-in-law, nephew and niece are coming for 3 weeks in June. I'm so excited! Actually, I'm more than excited!!! My sister-in-law here, as well as some friends have lent us all things baby and child related. I'm so grateful because I don't own any of that stuff. And my family will be staying at my house for a while so it is nice to have things here so they won't have to transport it. Enjoying - The local Farmer's Market. I absolutely love Farmer's Markets and I'm happy to tell you that Wichita has several to choose from. On Wednesdays there is a small market near my house. I've purchased fresh coffee, strawberries and local honey from there. On Saturdays there is a bigger market downtown and they have a coffee truck (which is awesome!!!! ), produce, cooking demonstartiosn and my favorite, a flower booth. Check out this awesome bouquet of flowers I got for $5! So pretty. Buying - barstools from Wayfair. Our friend has lent us his barstools until we purchased our own. I was wanting some adjustable ones so they can go with us to our next house. And no, we don't plan on moving soon, I think I just have the mentality that I will and therefor purchase things that are functionable for wherever we go. I knew that I wanted a white, adjustable bar stool with a full back that was padded and comfortable. I've been eying these since mid March and they had a big sale so I purchased them and they should be here Friday. Craving - Tea. Need I say more? ha ha! I keep talking about tea on the blog because it's so good. My go to lately has been jasmine with local lavender honey. Spiritually speaking I've been craving to study The Bible more on my own. I think studies are good but there is something to be said about diving into The Word, researching and allowing The Holy Spirit to show you things. I've also been craving to make some sort of my own Bible tract to share the gospel with others. I have a project in mind and hope to tackle that soon. I've been convicted that I haven't been gospel oriented here in America and that definitely needs to change. Pinning - ideas for craft projects for my mantle. I've also tried this buttermilk blueberry breakfast cake twice and it's been a hit! It's soooo good, especially with some tea or coffee ;) And I can't forget the PW's blueberry rolls. I've made those three or four times and I will make them again soon. What do you have planned for the month of June? Do you go to a local Farmer's Market? I love the idea of creating your own Bible tract. Angel's always been fascinated with Bible tracts and keeps a collection of them that apply to different situations so that he always has one for whatever he might need it for. :) I'm pretty excited about June and July and the fun adventures they will bring! What an awesome idea to design your own Bible tract! I think that's awesome! I've got to, got to, got to get back to reading my Bible. Have so much fun with family!! 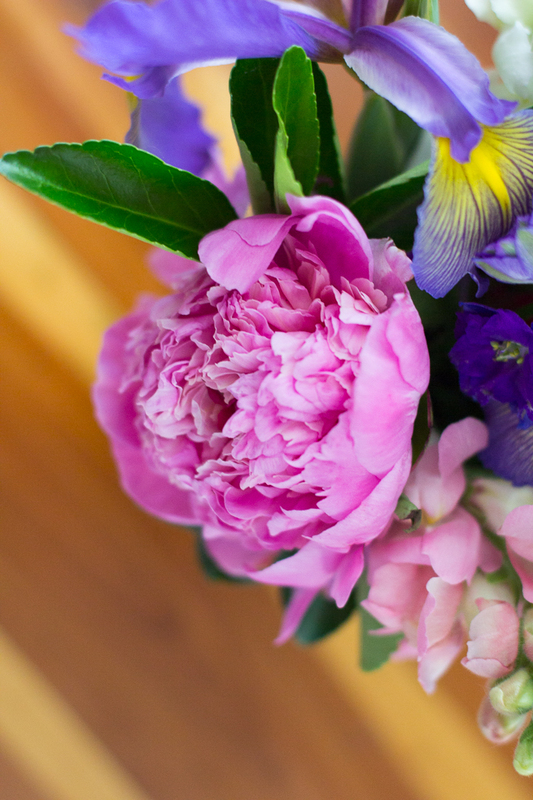 Your flower pictures are really good, Beka :) I love Farmers Markets and I love Wayfair! They have really great stuff for good prices. Glad you found some stools you like! And that's awesome your family is coming! That is going to be really fun. Yay for farmer's market season! I love getting flowers at mine - such a gorgeous bunch you found. Enjoy the family visit, and thanks for linking up! I love going to the farmer's market and getting a bundle of flowers for so cheap. Although, I haven't done that in a couple of years now! Enjoy your family visit! That will be so fun. 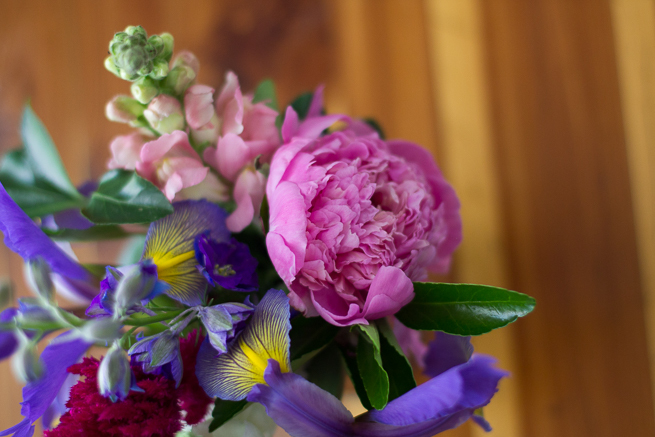 I’m loving the farmers markets, but love my fresh flowers from our weekly Trader Joe’s trips. Something about fresh flowers just makes me happy inside, haha. And having family visit can be so exciting. I just gave birth back in March to our first and our families are just itching to make it back out to visit. So beautiful! We are visiting family this summer too, so I understand your use of exclamation points :) Oh my goodness - we have TWO farmer's markets close by, and I have been neglecting them!! It's definitely time for a trip. Those flowers are gorgeous, and I'd love to stock up - farmer's markets always have the best flowers at the best prices. And a coffee truck?!? Can I just pay it to follow me around all day? Thank you very much ;) I have been inconsistent in my Bible study lately, but I've been seeing God work so much in my life - I am definitely craving better time with him so I can hear more of what he has to say, in his words.